All right, who knows 'Iron Man'? This is what a Rock N' Roll 1/2 Marathon looks likes. Deal with it. IF YOU run like the Little Engine That Could, you'll be rewarded with the Big Band That Did, as Train headlines the "Rock N' Roll" part of San Jose's Rock N' Roll 1/2 Marathon. 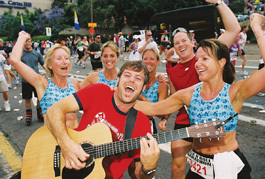 On Sunday, Oct. 8, get ready for music and motion coming together as as 15,000 runners rock this town. A 13.1-mile course will take runners through San Jose's downtown and surrounding neighborhoods, which will have bands and high energy cheerleaders supporting and pumping up the runners—a la Hans and Franz—every mile of the way, creating what may turn out to be the biggest block party San Jose has had this year. The marathon will be taking place all over San Jose and Train will be playing at the HP Pavilion after the race on Sunday, Oct. 8. The concert is open to the public and admission is included with registration in the race. Runners have only to show their race number at the door. Those who do not participate in the race can purchase tickets at www.RnRsj.com or at the Health and Fitness Expo on Friday, Oct. 6, and Saturday, Oct. 7, for $25.